Tomorrow, January 15th, I will once again run/walk (mostly walk) in the PF Chang 1/2 Marathon. This will be my 3rd 1/2 Marathon. I’ve been asking myself ‘why’? Why would I get up early and run/walk 13.2 miles? I haven’t really trained for this in the last two months, so why do I want to run and put my body through this? The answer is easy. 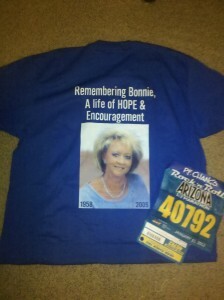 I’m running for Bonnie. The first two times, as well as the reason I started running five years ago, was an attempt to 1) Remain healthy per Bonnie’s request (she was fearful I’d die first and leave her alone to raise McKenzie by herself and without my wonderful sense of humor :) and 2) Raise additional funds for Bonnie’s increasing medical expenses. As I shared with a friend this week, “I don’t want to be melodramatic about it, but this run really is a spiritual experience for me”. When I run, I use the time to reflect, remember and really give thanks for the many people who have been so supportive. I remember and give thanks for the friends who have encouraged and coached me in this running endeavor (many by phone and email). I become focused and intentional to give thanks for the dozens and dozens and dozens of friends who were supportive during Bonnie’s illness and who remain supportive to McKenzie and me as we continue in our journey. And of course, I reflect back on all the very hard work and energies that Bonnie put forth to create a healthy life for her as well as for McKenzie and me. I am reminded at how short life really is and about what matters most on this side of eternity compared to when we cross over to ‘the other side’. And I’m drawn back to the foundational blocks for all of us and that is genuine relationships. Obviously the bedrock of all is our relationships is with the God of creation through Jesus, and second is the absolute necessity of community. The blessing of authentic, loving, life changing community is an essential for each and every one of us. So while the official name of Sunday’s run is PG Changs 1/2 and Full Marathon, in my heart it’s become, Bonnie’s Run (well and a lot of walking this year). This focused time of gratefulness is like a detox to my soul, as it draws my heart and mind towards the gift that Bonnie was and the faithfulness of God. I’m sure I’ll be singing in my heart numerous songs such as It Is Well with my Soul and How Great Thou Art and even this one. This year I had a t-shirt designed to communicate why I’m running (and it helps McKenzie to spot dad among almost 30,000 people). So if you are running this year, no doubt you will pass me, and you’ll know who I am not because I’m gasping for air, rather you’ll be seeing Bonnie’s beautiful face looking at you.